I was already aware of a couple of WW1 centenary events arranged for this weekend, but when I bought a Barnsley Chronicle this morning I was surprised to see that there is quite a lot going on if you know where to look. For me the most important is the dedication of the new Dearne Towns War Memorial at Bolton upon Dearne. After all it's not every day Barnsley gains a brand new, long awaited, War Memorial. The dedication will be at 11am in the Bolton upon Dearne Cemetery, everyone welcome, lots of room for people to view the new memorial. It lists nearly 300 men and women who gave their lives during the First and Second World Wars from Bolton upon Dearne, Goldthorpe and Highgate. 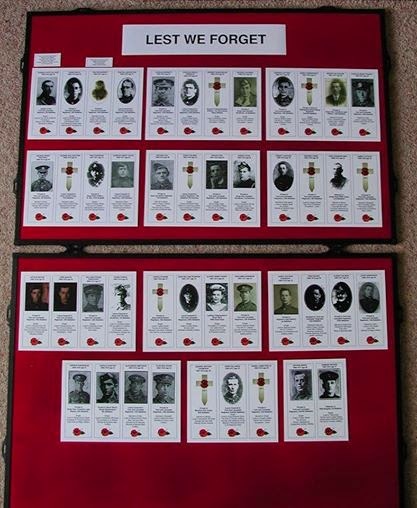 There are some pictures of the memorial under construction here along with an image of the list of names that has been seen around the area for the past year publicising the campaign to raise money for the memorial. Darton All Saints Church will be open for silent prayer and reflection between 12 noon and 1pm and 7.30pm to 8.30pm. 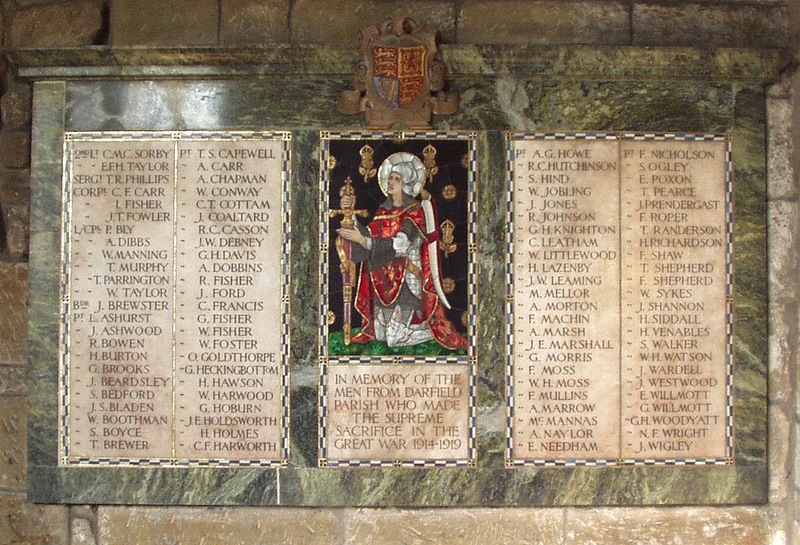 St Edward the Confessor at Kingstone will be holding a WW1 vigil service at 4pm with a display of pictures and information about the men on the their memorial plaque. Penistone Royal British Legion will be holding a short remembrance service at the war memorial in the Market Place at 11am. 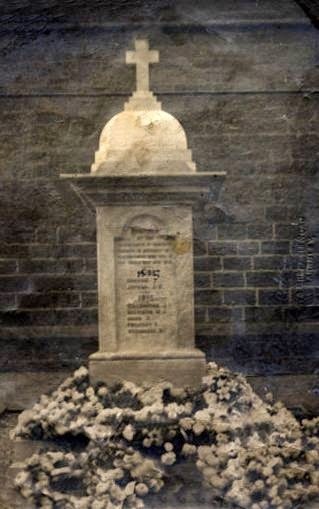 Remember that a book was recently published about the men on the Penistone Memorial, I wrote a post about it here. At Emmanuel Methodist Church on Huddersfield Road at 9.45am on Sunday Alison Saxby is talking about the Ministry of the War Graves Commission. The Royal British Legion will be at Asda on Monday from 10am to 4pm with their stall. They will be selling a book about the Barnsley Pals along with their usual fund-raising items. Ardsley Christchurch are holding events all day, beginning with Morning Prayer at 8.30am. From 9am to 4pm there will be refreshments available and a presentation will be running twice an hour for 15 minutes about the 153 men who feature on their War Memorial plaque. At 8.45pm there will be an evening vigil service. 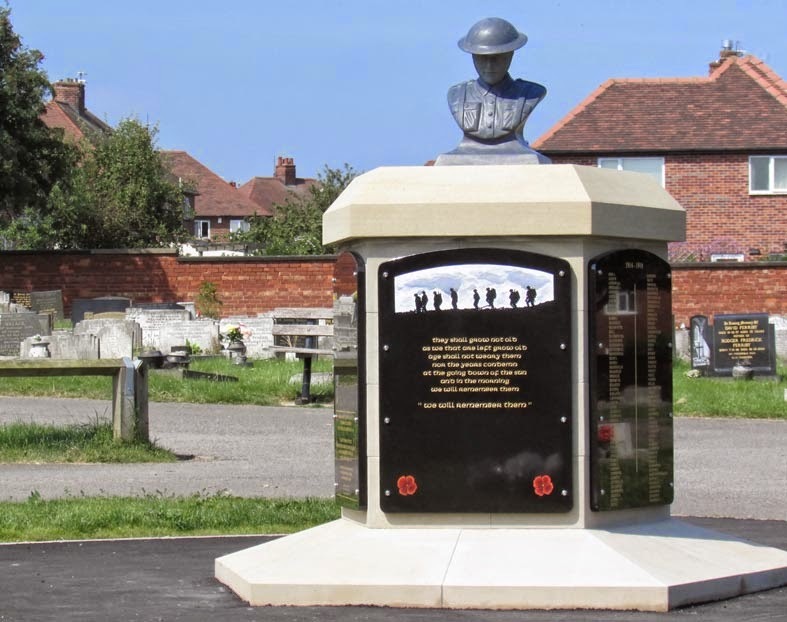 Billingley History Group are holding a film show with refreshments, presented by Jackie and Andrew Oates, in the Village Hall at 7.30pm on Monday on the men who are named on their two memorials. At the end of the evening the intention is to walk down to the memorials to light candles there. At Cudworth St John the Baptist Church there will be Evensong at 6pm followed by a reading of the names on the War Memorial. A book about each and every man on the Cudworth Memorial called 'Lest Cudworth Forgets' (£5 - don't pay more on ebay!) is available from the Cudworth Local History and Heritage Group who meet at the Cudworth Centre of Excellence (aka the library) on Wednesday mornings, 10am to 12noon. The Church of St Thomas and St James at Worsbrough Dale is having a time of reflection and prayer at their War Memorial at 4pm on Monday afternoon. At St Luke's Church Worsbrough Common on Monday at 3pm there will be a service of remembrance in the church grounds where their War Memorial is situated. The church is especially appealing for anyone who lost relatives in WW1 to come along. If it rains arrangements have been made to hold the service in the Church itself. 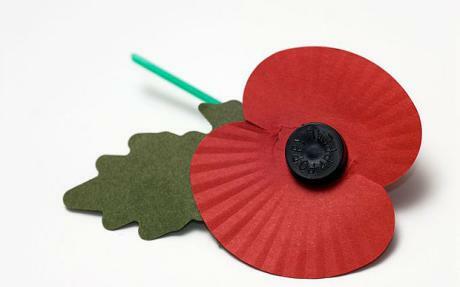 Worsbrough Village Church, St Mary's, is holding a World War One vigil from 10.30am. There will be a short act of worship with everyone welcome to attend the event which will continue until 12.30pm. Their war memorial plaque is inside the church and this is a great opportunity to visit it and remember relatives. Silkstone All Saints Church will be open all day on Monday for prayers, meditation and reflection and there will be a candlelit vigil between 10pm and 11pm - which runs alongside the national 'Lights Out' event. Darfield All Saints Church will also be open on Monday from 10am to 12 noon and from 4pm to 7pm. The Church registers will be available for people to view and inside the church, together with some beautiful memorial windows and plaques, is a very unusual memorial, the battlefield cross that marked the grave of Charles Sorby, the vicar's son, who was killed in WW1. Hoylandswaine's St John the Baptist Church will be open for prayer on Monday and there will be candlelit vigil between 10pm and 11pm. Emmanuel Methodist Church on Huddersfield Road are holding a combined event on Monday evening. At 7pm there will be a Concert of Remembrance with Dodworth Miners' Welfare Brass Band and the U3A choir. Entry by ticket only - ring Barnsley 293759 for more information. If I have missed anyone out please get in touch - and please let me or the Barnsley War Memorials Project via Facebook or Twitter, know about your WW1 Centenary Events for the next four years. Too poor and ill for a Post Office Account?